Another gorgeous day with little wind. For all of you who wish to study our final-day opposition, the Champs-Press bumps is almost on this vid; and for those who want to see what St Neots were really like, they appear here too on the row back. 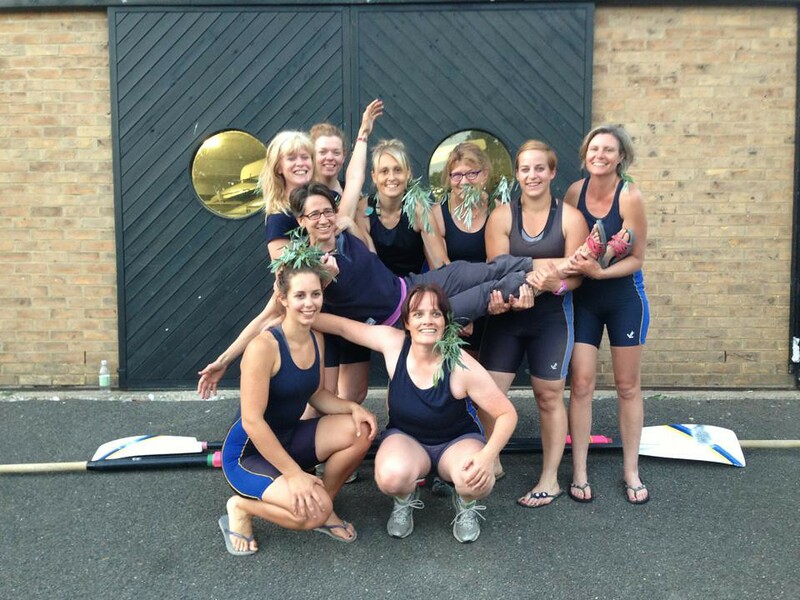 Thursday turned into our make-or-break day: having escaped Sharks on day 1, and got Nines 2 easily on day 2, we needed to get St Neots or face Sharks again on Friday; and whilst I wouldn't object to giving them another go, on the whole I'd say once was enough. We were one of the first boats to Stourbridge and waited around for W1 which was delayed by Something (always nice to see the old traditions maintained). We lolled around under cloudless blue skies joking about the marshalling. James H revealed that he had a cunning frustrate-the-Sharks plan: start badly, or not start at all, and let ourselves get bumped by Nines! Which would have given us an easy day on Friday bumping Nines back. Ingenious, and not something that would have occurred to me, but naturally we didn't seriously consider it, tempting as it was. No, we rowed for glory instead. John pushed us out on 45 (with no stream and no wind that made perfect sense, and he'd done it on Tues and Weds too) and Emma counted us down (I really should slip in some thanks to those two for bank-partying us, so here it is) and we set off perfectly aligned. The race plan was that St Neots would be a good deal harder than Nines, and we couldn't really expect to get them before the Plough, or possibly on the Reach, but that we should go off hard and try to break them. Last year they were shockingly fast, but we knew that this year we had a faster start than them. Although looking at the GPS trace I can see that our actual start wasn't desperately impressive - peak 1:27 - we've hit 1:20 on other days. We got one whistle fairly soon - after perhaps 15 strokes. We (well, I) regarded this as ours by right and, as planned, we really paid little attention to it - just keep it hard. Vague shouting from the bank not long after the A14 bridge suggested we'd closed to 3/4 length, which was welcome but not very important - we knew we weren't going to close just yet. Then somewhere in the fog of going round FP things started changing as we closed in to 2 whistles, and then rapidly 3; this was unexpected but quite welcome (at that point I was going through my usual mental fight with myself, which this year took the form of: "yes this hurts, but its going to hurt a lot more if you let Sharks chase you down the Reach tomorrow, so lets not let that happen"). It got somewhat choppy but we kept it up (the trace shows that, as usual, we slowed a little round FP but then we picked it back up to 1:38 / 1:39 and held that) until the bump. Which came rather suddenly in the gut. Actually there is some (poor quality but welcome) video that establishes the sequence: we're half a length down round FP, within at most 10 strokes that closes to overlap, and within a couple more strokes we bump / they acknowledge, about at the "change sides here" sign. Hurray for us. Next stop: Champs? Or Press? We didn't know at that point. It turned out to be Press. Bring on Friday. Tonight a different race. Nines 2 on their way down in front and the Champs Junior Girls chasing rather than being chased. We'd seen Nines 2 out training a lot but knew they's be feeling under pressure having been Bumped on the previous two nights and that they had some inexperienced rowers and they'd been Bumped fairly early the previous two nights. So we felt confident. We had a better start, Champs Girls did gain on us but we rowed calmly and started to gain ground on Nines, soon there were calls for a length, half a length, a final push and yes "Hold it up" we'd got them just coming into First Post. All very surreal after the previous two nights long hauls. Champs behind steered to avoid us only to go careering up the bank on the other side. To be filled in. But its lunchtime now. With two Bumps under their belt tension was rising. Tonight they had Cantabs 5 to chase but knowing they'd Bumped the crew we'd Bumped on the previous night at a similar place we knew it would be a longer row tonight. Taking full advantage of the bend at the start the crew went out fast hoping to catch them early but it wasn't to be. Coming out of Grassy the bank party were erging [I think you mean "egging"; though the idea of a bank party on wheelie-mounted ergs instead of bikes is quite appealling - ed.] them on knowing they only had until Ditton to the finish. A very gutsy row over. And another chance to catch them tomorrow.